Remotely Piloted Aircraft Systems ( RPAS) – commonly called “unmanned aerial vehicles (UAVs).” In contrast to remote piloted models called drones , they are advanced comprehensive solutions using unmanned flying platforms, UAV, to lift working units dedicated for the task. UAVs can be extremely useful to the services responsible for security and combating terrorist threats. UAV using high-end optoelectronic head can provide a high-quality image which allows recognizing objects even several centimetres big. Today’s solutions enable infrared observation or determination of a moving observation target, which a UAV follows. To meet market expectations, at the same time trying to meet the demands of our clients we offer control and registration of events using unmanned aerial vehicles, dedicated as a one-time, permanent or cyclical service. 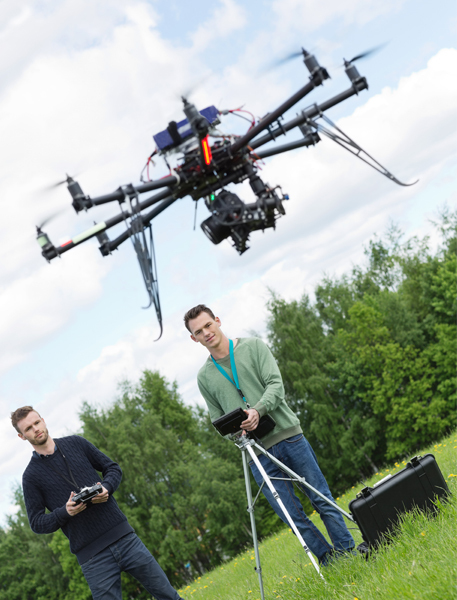 Services are performed by our trained specialists that have specialized health examinations and state authorisations – a certificate of Unmanned Aerial Vehicle Operator. The flights are each time agreed with the institutions responsible for the Polish airspace. Marketing material on request dedicated to the Customer‘s business. These applications of Unmanned Aerial Vehicles obviously do not cover all of their possibilities. The way of using this technology to improve our security and quality of life depends only on our imagination, needs and expectations.